Malaria is a global killer. Between 850,000 and 2,500,000 people die from malaria each year. Over 40% of the world's population is at risk of getting the disease that infects at least 250,000,000 or more people annually. It is estimated that malaria costs Africa over 12 billion dollars each year in lost productivity, money that could have been used to improve people lives. It takes time and money to rid a country of malaria; it is a disease of the poor. Historically, most countries around the world had malaria. In 1860 more than half of the United States was endemic. Wealthier countries eradicated malaria decades ago, as it is in fact an easily preventable and curable disease. Malaria is a disease of the poor, and therefore not always of great global concern, as compared to H1N1 or SARS, which have the potential to affect "first-world" citizens in their own countries. For comparison, the mortality rate of H1N1 was at least 99% less than malaria 2009. Yet H1N1 prevention has received more funding, and significantly more media attention. It is ultimately a question of priorities; more money has been spent globally on preventing baldness than has been dedicated to finding a malaria vaccine. Currently, the majority of money dedicated to malaria research and control comes from the West, but it still pales in comparison to funds dedicated to less deadly diseases and conditions. Solid gains in malaria control have been made over the last few years, but this is not the first time great strides have been made against the illness. In the 1950's and 1960's a significant amount of the world was made malaria-free only to have the parasite re-establish itself after international funding and attention was directed elsewhere. By showing how malaria affects individuals who live in countries too poor to eradicate the parasite, I hope to provide a clearer and more educated understanding of the disease that will hopefully encourage, in a small way, continued international support. All these pictures were taken over a months time in Cambodia, Uganda, and Nigeria in the late fall of 09. 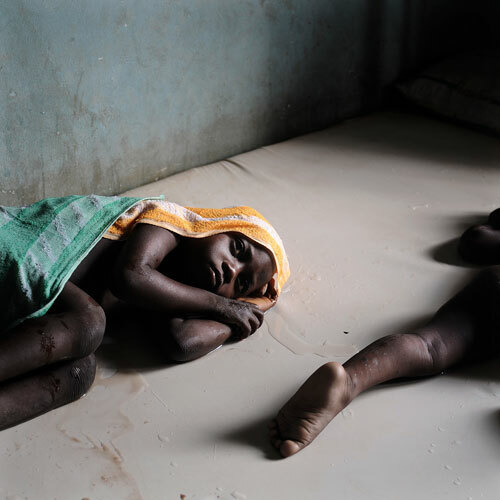 Two children recover after getting emergency anti-malarials at a clinic. Their immune systems are not strong enough to fight off the malaria infection as all humans are born with no immunity. Given time young children will develop a degree of immunity, but that will take exposure to the parasite and the risks entailed. "They were very sick; they both had convulsions. We had to hold them down while they were getting the medication to reduce the fevers. It's not that we are not concerned it is just normal" - Mohammed's father.